This lovely book celebrates both the should-probably-be-revived art of letter writing–yes, pen and stationery used for a communication process–and the special connection that can exist between people and their extended-family members. 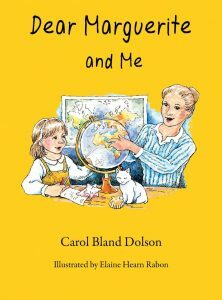 In this new offering by award-winning children’s-book author Carol Bland Dolson, we watch a little girl and her aunt plan a trip together. They make their plan through a series of letters, written in verse. As is not uncommon with this sort of communication, the letters ultimately reveal the characters’ personalities and, due to the subject matter, they also take us to exotic places. From Kokomo and Kalamazoo to Singapore and Serengeti, the people and places of the world take center stage. At the same time, the full-color illustrations by Elaine Hearn Rabon also give the reader a firm and pleasant grounding in the child’s surroundings, even as she and her aunt dream up their itinerary. An excellent read-together book for parents and children as well as an early read-alone book, it might also make the perfect gift for an extended-family member. Who knows? It could be the beginning of an enjoyable correspondence. Or a grand world tour.